I've been having lots of fun making these new wall signs mainly from plain ole' leftover 1x4's and such. Some larger, a few smaller. 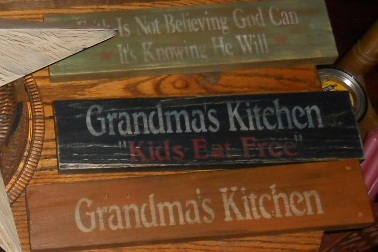 Today, well and past few days, I've been cutting and making some simple wall signs to sale in my booth. They are a great seller. Here's a few that I did that say, "Simplify." First I painted a base coat of whatever color. I usually use a burnt umber, colonial green or nutmeg. Those are my favs! 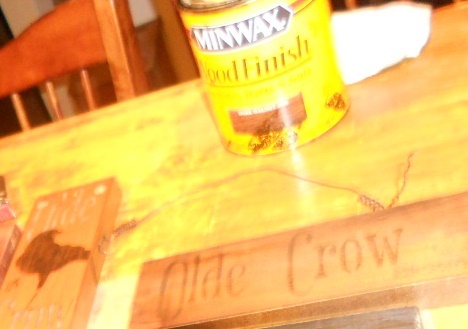 Then I stencil on the saying and or stars with an off white or antique white. Then, here's where I call it my "secret effect." I take a rough grain sandpaper and sand over the entire board, wording, stars and all. It kinda roughs it up and makes it look older and worn. Just the way I like it. And I am also rough on all the edges. And lastly, I use a stain that has a sealer in it. I rub some on with an old rag, wait a minute and wipe it all off. And repeat if it doesn't look old and aged enough. Here are a bunch of different sayings that I made all from stencils that I bought off from eBay. Then I finish it all up by adding a hanger on the back. I get those in packs at the Dollar Store for $1.50. On the one in the middle below, I was experimenting with using different colors. Not sure I like the blue so much. On the same one, also, I used the glue to make a crackly look, but the pic is not showing it so well. My favorite of the ones below is the "Pumpkins" signs below. Probably because it's right around the corner and I just decorated our home yesterday. I'm so in the Halloween mood! Here's how those came about. Some of them I left plain and then stenciled on the PUMPKINS wording in cinnamon orange. And to mix and match some others up, I first painted the board a cinnamon orange and then stenciled on the PUMPKINS wording in various off whites. Let the paints dry and then come back with some rough grade sandpaper and scuff up all the edges a bit. And then just finish up by adding a sawtooth hanger on the backs. I find these at the Dollar General in the tools section for a dollar or so.